Here’s a clip of Boston-bred soulman and 21st century rhythm & blues daddy Eli ‘Paperboy’ Reed along with his band the True Loves. It’s ‘Come and Get It’, the lead single of off his newest record of the same name, Come and Get It. This is Reed’s third collection of songs that hearken back to the classic soul period, evoking the spirits of Sam Cooke, Sam & Dave, Wilson Pickett, and James Brown, with a dash of the Chi-lites and Solomon Burke, too. While he and the band continued their extensive tour of Europe, and after I was sent a copy of the new record, I asked Eli about this single, about the release of his first album on a major label, about his love of records and record collecting, and about the rich traditions of an American art form; sweet soul music! The Delete Bin: The newest record Come and Get It is your third album, yet it’s your first on a major label (EMI-Parlophone). How did being on a major affect the way you’ve approached making and touring the record? 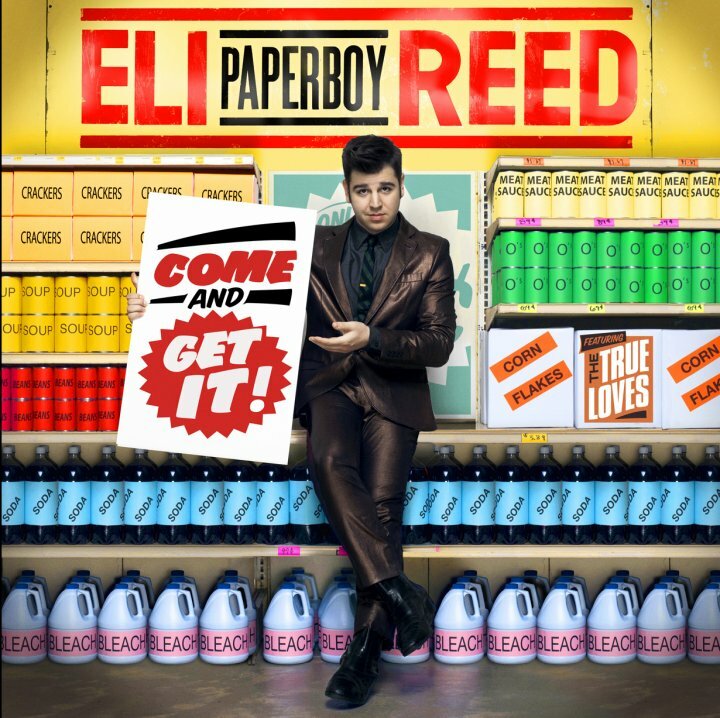 Eli ‘Paperboy’ Reed: It didn’t really change much of the way I thought about approaching the record-making process but it was great to be able to record the whole thing all in one go and to be able to get all the musicians I wanted. Really it was just having the budget to do what we needed to do and having the support to release in so many countries. That was a huge deal, having all the different offices in different territories, it’s allowed us to really go everywhere and get exposure because of it. DB: This new single, “Come and Get It”, the title track off of the new record sounds like a classic from Stax/Voltz and Atlantic, an AM radio hit. But, I get the impression it, and other songs like “Time Will Tell” and “Name Callin'” for instance, could have been written and performed as country songs. What do you think the connection is between these strains of American music? EPR: Well for starters, “Come and Get It” sounds way more like Brunswick Records or Twinight in Chicago than it does Stax or Atlantic but that’s neither here nor there. Country music and R&B have always gone hand in hand and I grew up listening to so much Country that’s really naturally informed my writing and style. The turn of phrase in “Name Calling” is actually sort of quintessentially 90s country wordplay. They did that kind of stuff all the time. I’ve been really embracing my 90s country upbringing lately and I think people like Don Schlitz, Paul Overstreet, Alan Jackson and a million others writing that stuff were amazing writers who had knowledge of so much music. It’s all about southern stuff really; country, r&b, gospel, blues. It all fits together. DB: You gained an interest in rhythm & blues initially because of records your dad had in his collection. These days with the Internet and all of the choice that it offers, do you think it’s easier or more difficult for kids to find classic soul music like you did? EPR: It’s actually both easier and more difficult. You have to know what you’re looking for and that’s the tough thing. Having a father with a great record collection or a great local record store means you can just browse and find stuff that has cool covers and buy it or put it on the turntable. I would just pull stuff out and be like “I don’t know what this is all about” and half the time it would be good. I still buy records that way, especially 45s. If the label looks good and it’s got a good title, chances are it’s a great record. I think people just gotta seek stuff out that they don’t know. There are great music blogs that people can go to but for the most part nothing can replace looking through the racks and the stacks. DB: You’re from the Boston area. When you were seeking out live R&B music as a growing musician and writer, was there a local scene doing the strain of music you’re currently doing near to where you grew up? EPR: I went to some shows and things with my Dad but for the most part I was in a vacuum, listening to records on the living room floor. As I got to be older in high school I went to see shows but not really R&B. When I came back to Boston, though after Chicago I started playing in all these little churches and that really opened my eyes to that kind of music in Boston. I sang in this Gospel Quartet in Boston, the Silver Leaf singers, I was the only member under 65 and also the only instrumentalist they ever had. I played acoustic guitar and sang the high tenor parts and they even let me take some leads. It was amazing. We sang at the funeral of one of the oldest members who I got along well with because he was from Mississippi and we knew alot of the same places. It was heavy. At the same time I started finding R&B and Gospel records that came out in Boston in the 60s like “Young Girl” and I started going to Skippy White’s record store all the time and talking to him about the records he released. By the time I moved to New York I had found almost every record he put out on all of his labels. He had Silver Cross for Gospel, WILD and Bluestown for R&B. DB: Having been a singer and instrumentalist in a gospel church while you were going to school in Chicago as you mentioned, but also spending time in Clarksdale Mississippi in juke joints , how did the contrast of these experiences inform your music and performance style? EPR: Well how long have you got? That’s a tough question to answer in a short amount of time. I guess it’s sufficient to say it really shaped everything that I do. I learned about performing and keeping a crowd in Clarksdale and I learned to be tough and thick-skinned. In the churches I learned that as a performer it’s not about you. It’s about the audience you’re playing for. You have to do everything you can for them. In Church, if they get the spirit, you stop when they’re done, not when you feel like stopping. DB: Your popularity as a live act is undeniable, especially in places like the UK and continental Europe where you’ve spent a lot of time building a loyal following. How do European audiences appreciate soul music and rhythm & blues compared to audiences in the States and Canada? EPR: I really don’t think there’s much of a difference in the actual audience, but clearly people in the UK and Europe are a little bit more scholarly about their appreciation of American music. When it comes to playing shows though, it doesn’t make a difference where you are. A good audience is a good audience. DB: Your influences can be detected and attached to certain clearly defined musical traditions, yet you clearly have an artistic voice of your own. How have you managed to avoid the temptation to simply take up the characteristics of a style, rather than find that voice? I spent thousands of hours listening and taking things in and learning them. That’s how you ingrain things in your mind and let it come out as your own. If you don’t know the music you love (and why you love it) like the back of your hand, there’s no way you can come up with something new that’s based on that. Everybody needs to spend more time just listening to music, I think that’s probably the biggest problem with most singers these days. DB: Your first record Sings Walkin’ and Talkin’ and Other Smash Hits!, which was released independently. Any chance of a re-issue? EPR: I hope so, man. I’d love to put it out on vinyl. I might wait a little while longer until the price hits $100 on ebay though! What a thrill to get to interview Eli! As you can see, he was extremely generous with his time, as reflected here. Thanks, Eli! You can check out music, tour information, buy the new record from the official Eli Paperboy Reed site. Also, you can follow Eli Paperboy Reed on Twitter for real-time updates from the man himself. And be sure and check out the Eli Paperboy Reed Facebook Page, too.